This is a screenshot of the robot's user interface that allows it to be controlled remotely with any wireless device. The interface runs locally on the robot's built in server so any device that can connect to the internet can connect to the robot. The interface currently only supports teleoperation (remote controlling) of the robot but I have included a button that will eventually allow me to set the robot to operate autonomously by default. The blue reset button will restart all of the robots systems in case of an error. 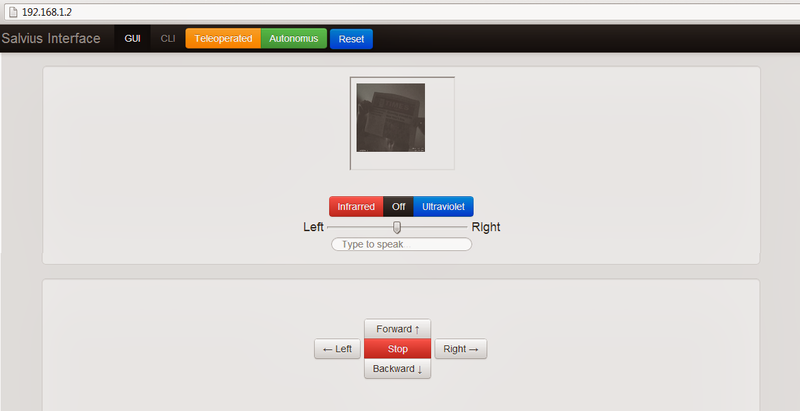 From the main screen of the interface you can see input from the robot's camera. The buttons allow inferred or ultraviolet lights to be activated to help the robot see in dark places. The slider will control the movement of the robot's head left and right and the text box bellow that will let you type text that you want the robot to say. The directional controls at the bottom of the screen control what direction the robot will walk. I haven't designed controls for the arms yet. 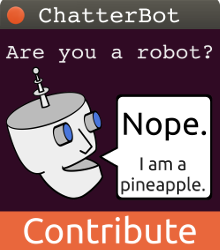 My goal is to keep the interface as simple to use as possible but eventually I would like to design a feature where the robot's computer maps out what the camera is seeing to identify objects. You would then be able to select an object that the robot is looking at and have it pick it up or do some task with it.